The Narrow Water Castle and Estate has been the property of the Hall family since 1670, the first home being the Old Narrow Water Castle, an old Norman Castle built on the shoreline of Carlingford lough, now a national monument. 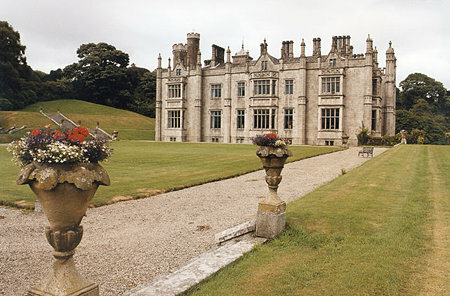 The family then built Mount Hall, an Irish long house, on nearby rising ground (c 1690) and lived there until the early 19c when Roger Hall built the present castle-an extravagant Elizabethan revival mansion all in local granite. The Narrow Water Castle estate is a visual feast for those interested in Architectural heritage and it provides a perfect backdrop for opulent weddings. Dating back to Norman times, the estate expanded over the years. It now features a rich fusion of architectural styles spanning three eras. The Estate is more than just a picturesque landmark. It also serves the community as a working resource, housing a Lime Works and agricultural land. Narrow Water Castle is situated in an ideal, convenient location. It is even accessible by helicopter! The estate enjoys easy access to a vast range of leisure pursuits and tourist attractions. Narrow Water Castle offer a variety of package deals with Weddings, Marriage Ceremonies, Champagne Reception and Dinner Reception. Narrow Water Castle offer the castle and grounds as a meeting place and as a place to relax. Although the estate is considerably smaller, there are still over 300 acres of parkland and farm-land plus another 400 acres of forest, lakes and woods. Inside, all of the rooms overlook beautiful scenery. Holding a conference in this beautiful part of County Down can only accelerate the “feel good” factor. From the moment you reach the dual-carriageway between the city of Newry and Warrenpoint, your colleagues, clients and friends cannot fail but be impressed. The Castle and grounds are a perfect venue for professional people to get together for conferences and formal or informal gatherings. The large dining room can become a dark room for film and computer projections and can seat up to sixty people. The grounds and forest are perfect for relaxing walks between lectures. Meals and snacks can be served, even barbeques on the lawn.